Compliance must be supported by Certificates or Documents all of which must be issued by Independent Bodies with whom they have no links or affiliations. It is mandatory within ISO17712:2013 that all Manufacturer and Supplier claims for ISO17712:2013 compliance must be supported by Certificates or Documents. There are many security seal manufacturers who are claiming that they are able to offer C-TPAT Compliant Security Seals as a specific part of their marketing, promotion and sales activities. Sorry - they cannot ! These claims are influencing Buyers who, when issuing supply tenders or request for quotations, are stipulating that they require C-TPAT compliant seals. Sorry – there is no such thing ! The Acme Bolt seal is an ISO 17712 H compliant Bolt Seal and therefore may be used on U.S. bound C-TPAT traffic. 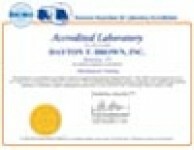 The Acme Seals Test Lab report on the Bolt Seal is a digitally signed document originating from the Test Lab used. To avoid circulation and exposure to fraudulent or illegal copies of this document it is essential that interested parties download the document from this site only or as an alternative request that either Acme Seals company send a genuine copy to you via email.